Thanks to professional logistics it is also possible to ship smaller amounts of goods. In partial transport different orders are gathered together, possibly stored in a warehouse in Gargazon and delivered on time to their destination. 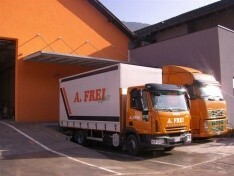 Every day small goods are delivered and collected in the region of the north Italy. We can find individually adjusted solutions for every customer.